I got another Kiev 5 recently. The shutter in it was jammed, so to figure out what was wrong I had to go in much deeper than last time. This one was made in 1970, two years after the first one I got. 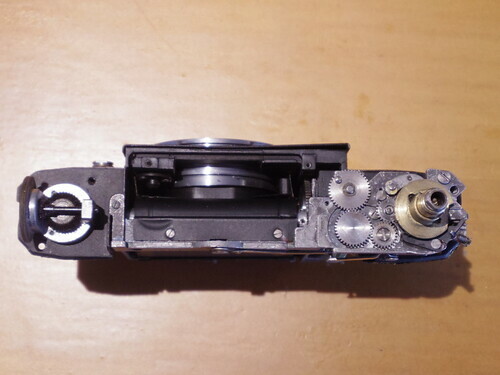 There are a few cosmetic differences between them: the winding knob is a different shape, the self timer lever has changed from one same as on the Kiev II's to one found on the later Kiev 4's, the rangefinder eyepiece is now round, and the flash sync port has moved to the right. This one also has a Helios 94 50mm f1.8 lens, compared to the Jupiter 8 HB 50mm f2 lens on the earlier one. 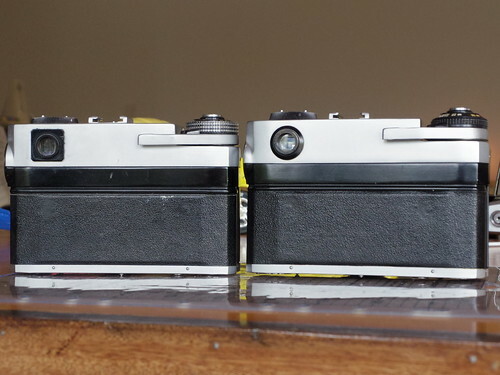 The majority of the Kiev 5's I've seen online have been the later model, apart from the earlier one I got a few years ago, I haven't seen another one for sale like it. and under the meter is the rangefinder optics. 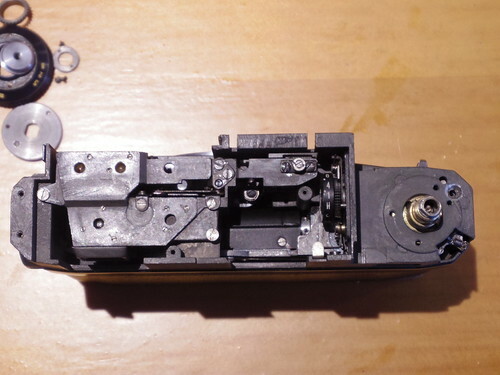 Since the mechanism had a jam somewhere, I decided to take the shutter curtains out, thinking that maybe the gears had unsynced somehow. 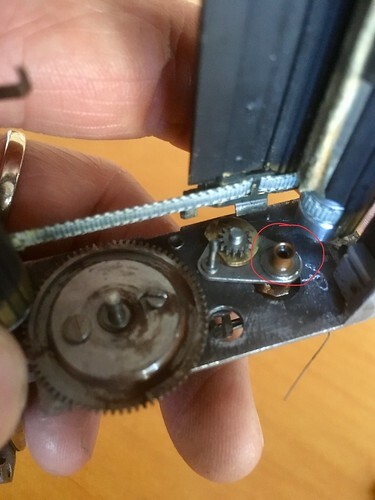 But after a long time I realised that one of the gears for the slow speed mechanism had completely seized! I had to put some oil and heat it using a soldering iron to free it up and remove it for cleaning. You can see the rust underneath it once I removed it. Once I found that, putting everything back went without too much trouble. The camera feels well made and it feels as smooth as some of the Contax II cameras I have when winding the shutter. 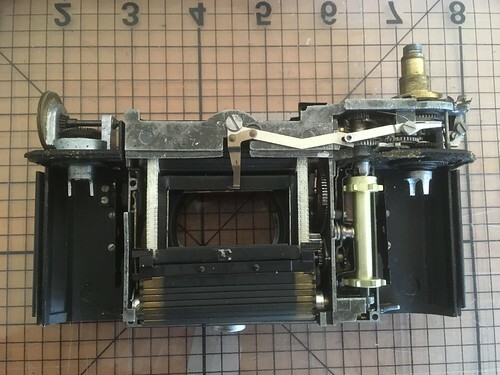 While the shutter mechanism is similar to the Kiev II/4, there are additional parts on the Kiev 5 for its frame counter and lever wind. 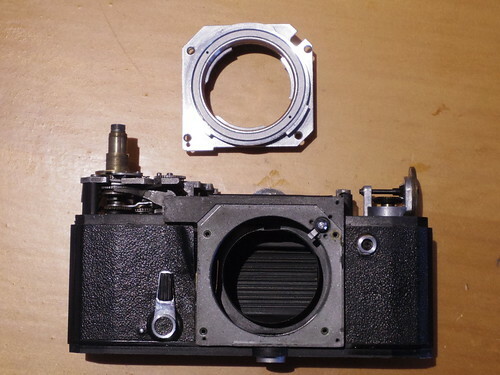 The lens mount has also been changed, none of the internal mount contax/kiev lenses (5cm sonnar/jupiter) will fit. Only the external mount lenses (Jupiter 12, 9, 11) can be used, as well as the external mount lenses specially designed for this camera (Jupiter 8HB, Helios 94) but these don't fit on any other kievs. Overall I feel that if you're familiar with going inside a Contax II or Kiev II/4 camera, then the Kiev 5 shouldn't be too challenging. 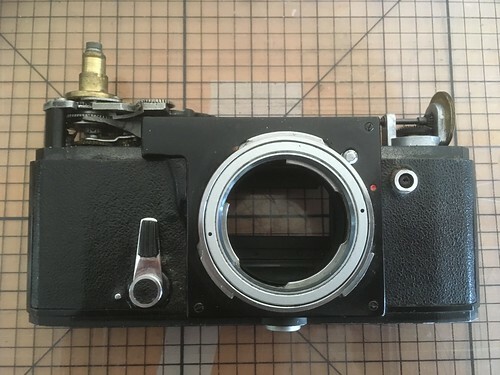 It's the only camera in this family with a lever wind, and the rangefinder window is very large, bright and easy to focus with. 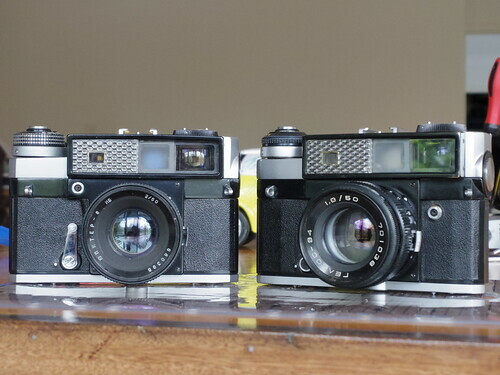 Adjustment of the rangefinder is also alot easier than on a Contax. Interestingly, I read somewhere (here?) 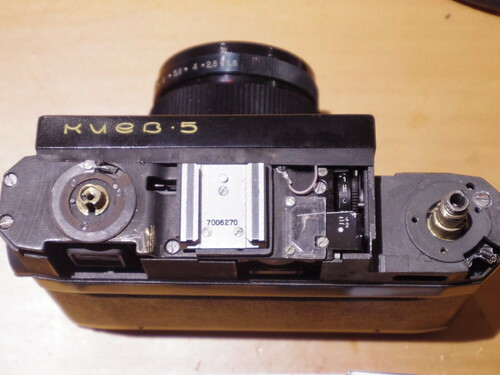 that the Kiev 5 models made a few years after this (1973?) have an additional 85mm frameline in the rangefinder. 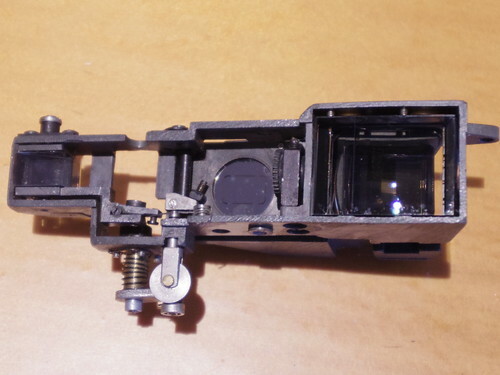 I hope someone will find this useful if they ever decide to tackle this camera for themselves. Nice work ! I like a lot that camera. IMHO one of the finest Soviet rangefinder. I also have repaired some. 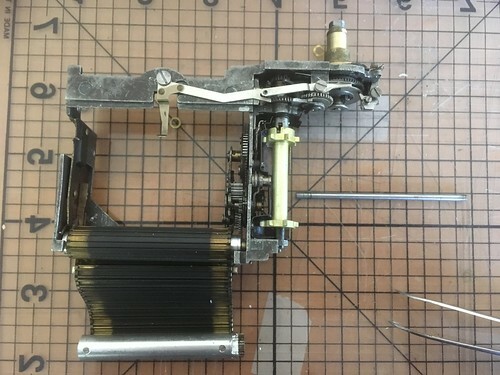 The rewind lever is difficult to remove. A special tool is needed I believe. You're right, last models have 85mm frameline added. Fortunately the rewind part on both of mine came loose just using a rubber tool. 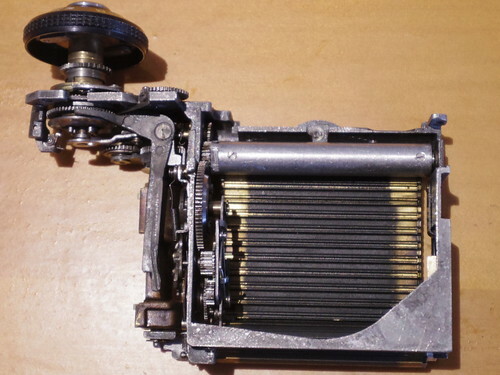 I had trouble with installing the brass disk which was pressed on top of the lever wind spring. There must have been a social tool for that! I�m hopefully going to try it out with some film soon. And look for one of the last models maybe.